Once thought to be reserved for bodybuilders, the last several decades of medical research have consistently revealed a variety of benefits of strength training. Let’s review what is strength training, its benefits, and how you can get started with a strength training program immediately regardless of your age or experience level. If you’re like most, you think that strength training requires huge amounts of weight plates, chalk dust, and screaming as you lift a barbell. In reality, strength training is a type of physical exercise where you use resistance-based movements. This could involve weights such as dumbbell or barbells, but strength training can also be bodyweight-based. For example, a push-up is an example of a strength training exercise as much as the bench press. Improves Bone Density: One of the biggest predictors of bone health and risk of injury, as you age, is bone density. Your bones need the physical stimulation of impact exercises to become stronger. A strong correlation has been shown for decades between strength training, improved bone density, and reduced risk of injury. Increases Metabolism and Fat Burning: Being sedentary is a vicious cycle that allows your muscle mass to waste away while increasing body fat. In one study, researchers confirmed that in ten short weeks, strength training was able to increase metabolic rate by 7%, promote a weight loss of four pounds, and increase lean muscle by three pounds. Promotes Lean Muscle Mass Growth: Having a lean and muscular physique isn’t just aesthetically pleasing, it also supports your health. Lean muscle built via strength training helps with weight management, supports connective tissue health (e.g., elbow and ankle), reduces injury risk, and improves your ability to complete day-to-day tasks. Boosts Brain Health: One of the fascinating discoveries of the last decade is the connection between physical exercise and your brain. Studies show that a consistent program of strength training can improve your memory, alleviate stress, and fight off cognitive decline. Variety Increases Compliance: One of the most common reasons that people throw in the towel on their fitness goals is boredom. Strength training offers a variety of options for exercises from traditional weightlifting to specialized classes such as CrossFit and kickboxing. You could change your focus each month for one year and still have plenty of options. Ready to get started with strength training? Let’s first discuss common acute variables you’ll see in strength training workouts. Knowing about these acute variables will allow you to read and understand workouts as well as be able to build your own. Repetitions: This term refers to the number of times you’ll physically perform the movement listed. For example, if your workout says “15 push-ups,” then you’ll complete a push-up 15 times. Each push-up is one repetition. Sets: This term is the number of times you’ll complete one round of repetitions. For example, if your workout says 3 sets of 15 push-ups when you complete 15 push-ups, that’s one set. You take a short break, complete 15 more, and that’s your second set. You’ll see varying tempos depending on the types of workouts you try. The most common one that focuses on building both muscle and strength is 2 / 0 / 2. Rest Break: The more intense the exercise, the longer your rest break should be. Try to rest no less than 60 seconds and no more than 120 seconds between sets. Warm-Up: A light cardiovascular-based workout that you perform at the beginning of your workout. For example, walking on a treadmill, doing jumping jacks, and riding a bicycle. This should include a stretching session. Cool-Down: Another light cardiovascular-based workout and stretching session performed at the conclusion of your workout. Now that you know the benefits and terminology of strength training, here’s a workout for beginners and experienced lifters that you can follow. Before beginning any fitness program, please be sure to check with your doctor or chiropractor. If you don’t have a chiropractor, feel free to give us a call to discuss beginning a strength training program at 773-878-7330. Below, you’ll find two types of strength training programs: bodyweight-based and external weight-based. The two programs offer a beginner’s and experienced lifter’s option. If you’re a beginner, we recommend hiring a professional trainer to teach you these exercises are considered the foundation of fitness. Once you master them, you’ll be able to take on more challenging workouts. Continue to push yourself each week by adding one more repetition, increasing the weight a little, or shortening your rest break. There is a common exercise myth that strength training is too advanced or not recommended for older adults due to injury risk. This couldn’t be further from the truth. In fact, strength training has been shown to reduce the risk of injury in seniors. While it’s important for older adults to take their time and ease into a workout program, there are several key benefits that are unique to seniors. Reduces Risk of Injury: As mentioned above, strength training has been shown to reduce the risk of day-to-day injuries in seniors. Studies show that seniors participating in a strength training program are less likely to be injured from falls or bone density issues. Regaining Independence: Continuing with the point above, the reduced risk of injury allows many seniors to regain all or some degree of independence. 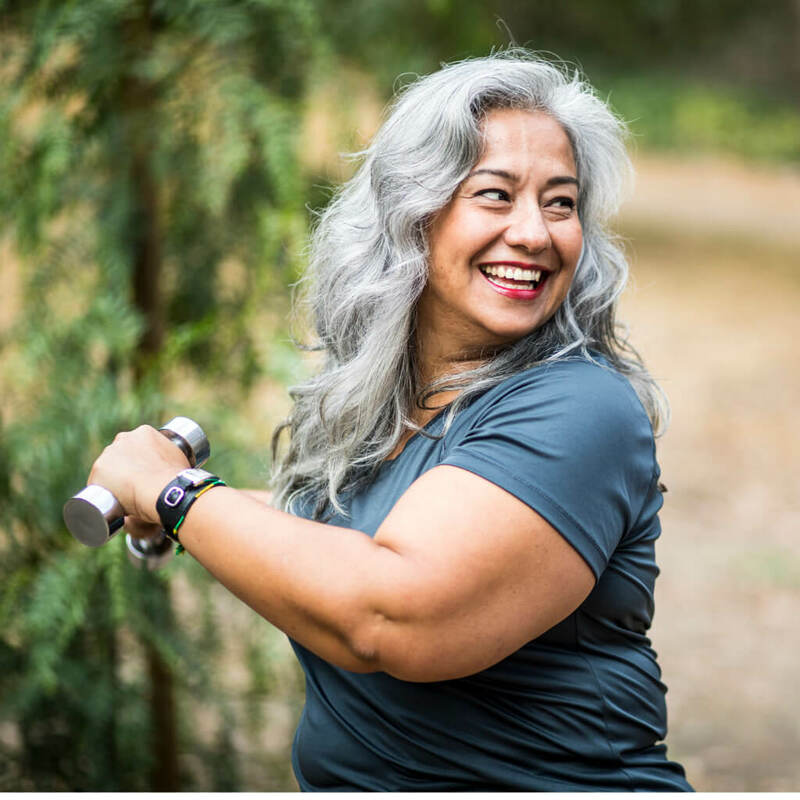 Weight Management and Decreased Risk of Diabetes: As we age, our metabolism naturally slows down, increasing the risk of weight gain and related diseases such as diabetes. Studies show that strength training can support long-term weight management while reducing the risk and consequences of illness. Improves Overall Quality of Life: Experiencing less pain, reduced risk of injury, decreased risk of chronic illness, and longer lifespan is going to dramatically improve the overall quality of life for older adults. Strength Training Workout for Seniors As mentioned above, if you have no experience with fitness, we highly recommend hiring a professional personal trainer who specializes in working with older adults. Your trainer will help you to properly perform and understand the benefits of each exercise. If you’re able to complete both the beginner and advanced bodyweight workouts, visit the strength training workouts above. Begin with the beginner bodyweight workout, which features squats, pull-ups, lunges, and push-ups; all of which can be performed on assisted machines to counterbalance your bodyweight. All strength training workouts should be complemented by cardiovascular exercise and stretching. Cardiovascular training or exercise that increases your heart rate and breathing rate is necessary to improve endurance and support cardiovascular health. Cardiovascular Workout: 5 to 10 minutes of a light cardiovascular-focused activity such as walking, jogging, running, cycling, calisthenics, kickboxing, etc. Stretching: There are two types of stretching: dynamic and static. Dynamic stretches mimic those movements you will perform in your workout. For example, if you will perform squats, as a dynamic stretch you could use quarter or half squats. Static stretching is when you extend a muscle and hold it in place, feeling a pull and lengthening. Perform 5 minutes of dynamic stretching in the beginning of your workout following a light cardio session. At the end of your workout, use static stretching for 5 minutes. Stretching: Studies show that stretching before, during, and after exercise promotes blood flow and can reduce muscle soreness. Nutrition: Giving your muscle tissue the nutrients it needs to rebuild and recover will reduce soreness and get you back in the gym faster. Eat a well-balanced diet of natural and whole foods. Focus on protein-rich foods and supplements as this contains amino acids, the building blocks of muscle tissue. Apply Ice: You can apply an ice pack directly to the sore muscle. Do not attempt to exercise with a cold muscle as this will make it worse. Epsom Salt Bath: Soaking in a warm bath with Epsom salts is a great and relaxing way to reduce soreness. However, do not take a bath immediately following a workout. Save this for hours later such as before bed. Massage: Having a deep tissue or sports massage can help to break up adhesion or muscle knots, reduce soreness, and promote recovery. Most common with athletes, overtraining is becoming a concern for the average weightlifter as well. It’s important to give your muscle tissue ample time to recover in order to avoid the symptoms of overtraining which include fatigue, mood swings, and muscle loss. In general, try to give each muscle group two to three days of rest in between workouts. For example, if you exercise your legs on Monday, we recommend waiting until Wednesday or Thursday before completing a leg workout again. Aside from spacing out your workouts, be sure to follow a healthy diet as nutrition plays an important role in recovery and avoiding overtraining. Do You Need a Specialized Strength Training Program? Have you had a series of operations or injuries that might limit you during strength training? Do you want to get started with strength training but you’re not sure where to begin? Give us a call at 773-878-7330 to schedule a consultation with one of our strength training experts.